That's not what we meant by "carpool," Ford Focus. Arkansas TV station KTHV has the scoop (sort of) on a Focus hatchback that mysteriously ended up in a woman's swimming pool in Maumelle this weekend. I say "sort of" because very few details are offered here. A homeowner in Maumelle received a surprise Saturday night as she came home to find a car in her pool. The Maumelle Fire Department said three of its crew members helped pull the car from the pool at 5:19 behind a home on the 40 block of Victoria Circle. They said the car had driven through a fence off of Trevino Drive and into the pool. 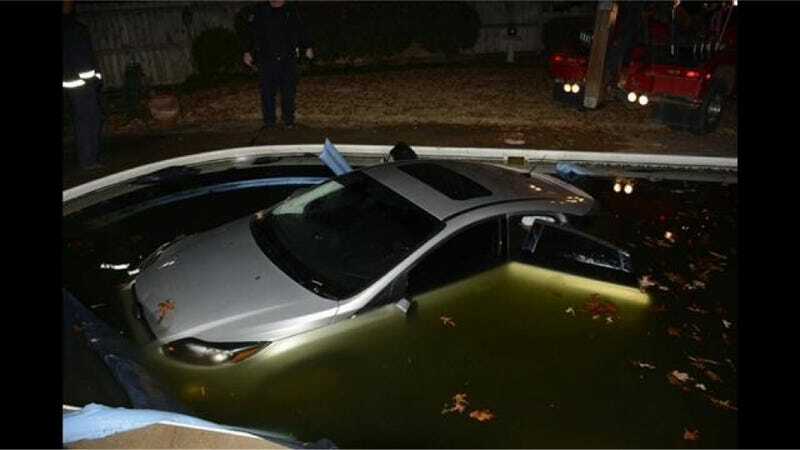 No word on who the driver was, or why on earth they would put a Focus into a pool. Sorry for partying, I guess.